There are endless biking opportunities in and around Georgetown Lake. 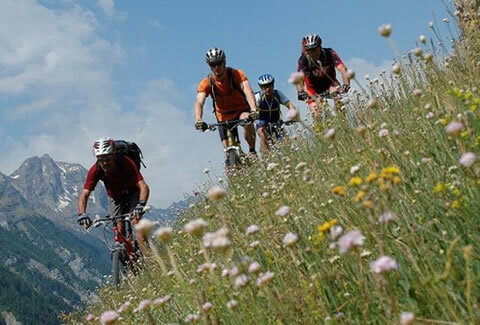 Many of the hiking, horse trails and 4-wheel trails are ideal for mountain biking. If you prefer pedaling the roads, take a 7-mile loop around Georgetown Lake. If you like to feel the wind in your face and have the stomach for traffic blasting past you at 70 MPH, you could cruise down the mountain to Anaconda. Have friends meet you for lunch and drive you back or, if you’re getting ready for a triathlon, head back up the hill. For those who like bike camping, enjoy one of Georgetown Lake’s 4 campgrounds, try a ride over to East Fork Campground, Storm Lake or down the pass to the Flint Creek Campground. Discovery Bike Park is a fun, challenging course designed for experienced mountain bikers and park riders. The park is located on the backside of Discovery and drops riders approximately 1,050 vertical feet. Features include wall rides, bridges, jumps, logs and drops. Professionally maintained for a true pro-style experience. The trail-use-only ticket is just $5. Or jump on the Silver Chief Chairlift for $28.